MY FRIEND COULD NOT FIND THE PANTS STRETCHERS. HAD USED THEM YEARS AGO. THE NEW ONES ARE FAR BETTER THAN THE OLD STYLE - SHE WAS PLEASED WITH THE GIFT. GAVE HER THE INFO TO ORDER MORE PAIRS. The pants stretchers are very handy for drying my jeans on after washing them. 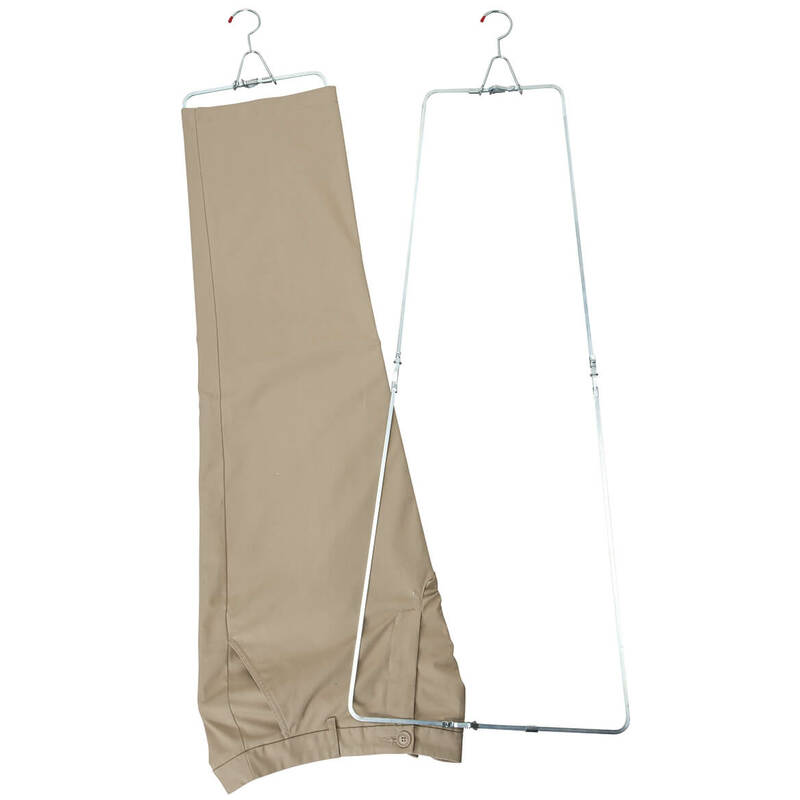 Just slip pants stretcher into legs of wet jeans, spray starch and hang up outside to dry. In a couple of hours they are dry, starched and ready to wear. I am replacing the ones that finally "died". I used these from the days of childhood. They finally died and I have been looking for them since I had to toss them in the trash. I love the way my pants looked when I dried my pants on these. I have been looking for new ones looking for new ones about 3 years. Never thought about going online to search. Last pair I bought was for Momma in a Woolworth's Dime store. Can't wait for payday. We use the pant stretchers on jeans and hang them to dry and there's almost no ironing after they dry. My husband used them in the service and so I ordered them through Miles Kimball and they work great! Using the pants stretchers helps to keep my husbands jeans neat looking while drying, with a soft crease. NO IRON PANTS STRETCHER,THE BEST!!!! Growing up my mom had these and they were great to use, I didn't have to pull out the Iron . The pants strechers are a great time saver, no ironing unless you want a sharp crease. a good way to have your pants dry evenly. I wish the pants hanging clips were attached to the hangers instead of being speparate. The pant stretchers are what I've been looking for. I use it on all my washable pants. Easy to learn how to use them. Searched for quality product for pants stretchers. These are working nicely. Sure beats ironing! I tried the pants stretcher for slacks and it worked well, except that the expand mechanism is located in the middle of the leg, so the crease isn't uniform. I really wanted it for corduroy slacks that I'm loath to iron. Product is easy to use. I get pants that look like the legs have been iron and presses. They do work, but in trying to design them for more compact storage and shipping they made them more difficult to handle than to older ones my grandmother had. They also made them too small in the upper thigh area, with not enough expansion to tightly fit and 'stretch' the pants. the slide locks do hold well once you get them in place, but again needs more expansion for bigger people. I might buy more, but it will depend on whether or not I can find the right size metal stock to make my own like they used to be. Recommending with the caveat that spme people might find them awkward to handle and get set. The stretcher is too short and doesn't open wide enough to give a good crease. This product is of very poor quality. Clips and springs are easily bent out of shape. Expansion is ok for very small pant legs but are useless for cargo pants. used once then threw away. Because I needed em...pressing costs too much at cleaners. Only place I have found that sells these. Husband likes creases in his pants as well as me. I don't (nor does he) always have time to press. My husband has some jeans that come out of the dryer wrinkled. His mother used these when he was growing up and he wanted to get some. The new fabrics sometimes can't be dryer dried because they shrink to much. this product helps. My mother-in-law used these and I wanted to have some of my own. My mother has them and she loves them. Used nthem before. Loved them. Due to severe back pain I cannot stand at an ironing board to put creases in pants. I have seen these used a long time ago and thought they would help me still make things look nice. I like the idea of using this product for my umpire pants. I have ordered pants from an online store and the pants (all pants) the creases are off-centered. Used as child with my Dad's slacks. Been wanting some for years. My friend likes them when he launders his own jeans. They make a really nice crease and lasts for days until time to wash them again. These are great for making creases in long pants. My grandmother and mother both had sets of these stretchers when I was growing up and I think they are wonderful. There is a reason the Greatest Generation was the greatest. "Pants stretchers" is just one on many. I have been looking for this item and you have it. My husband really likes these for his jeans. Keeps them looking nice and creased. Maybe now I won't have to struggle ironong my husband's pants. My dad used them when I was young and they worked for him. It seems like an easy way to make sure slacks look neat and pressed. I have some of these that my mother had many years ago, and have never been able to find any like them until now. I have used pant stretchers in the past and they are great for helping pants to dry without wrinkles especially when the material is heat-sensitive and ironing is not desired. My mother used these pants stretchers back in the 60's and now I've decided to use them to keep my jeans from shrinking. They were easy to use back then and I hope they will be as easy to use now. They kept your jeans from shrinking and also kept the crease in them or regular pants without having to iron them. They only took overnight to dry and were ready in the morning. I am glad to see they are still around. I'm tired of ironing slacks. These stretchers should do the trick. Hoping that these will help eliminate the ironing some. My husband is looking for a quick way to crease his pants and he hopes this works. They're great, and my husband REALLY, REALLY needs them! Do they actually adjust in length and width? BEST ANSWER: Thank you for your question. 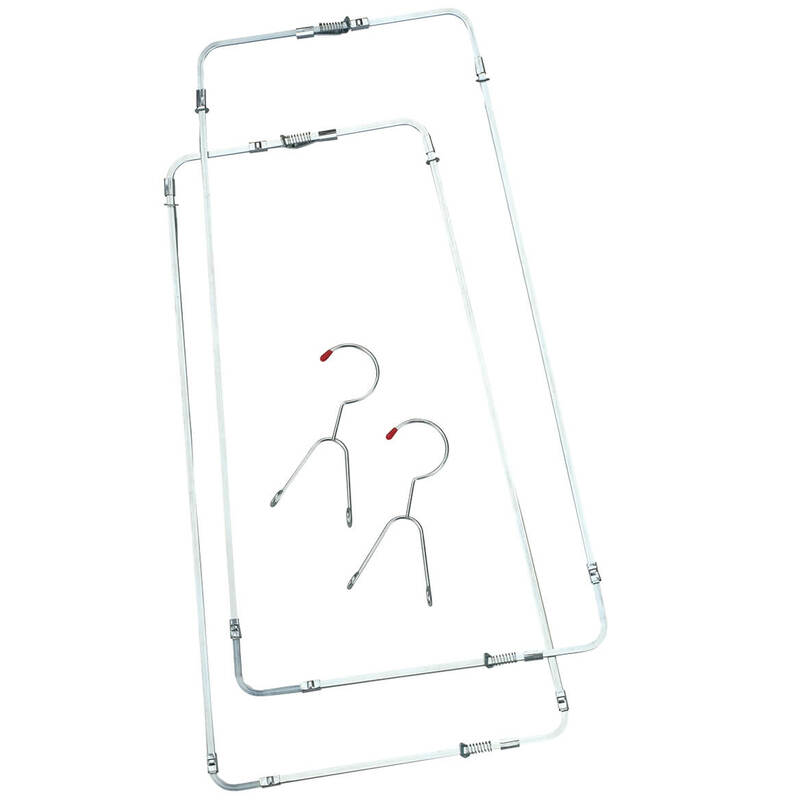 Each 12 3/8" L x 10 3/8" W adjustable stretcher extends to 39" L x 17" W. We hope this information will be of help to you. 11 ¾ 7 ¾. are yours the same? Will they help stretch the waist? BEST ANSWER: No. Well, not unless small wast. I am woman's size 18 and these will barely work for keeping legs straight.. I wish I could stretch them tighter, but they do help with wrinkles. Look around at your chair tops. I have a steno chair that works for stretching waist. I have no idea. They work great, though! Would these work for tight cigarette style jeans? These are 5" (10" altogether) width at the bottom. I'm a size 2. BEST ANSWER: Thank you for your question. Unfortunately these will not work for you. We hope this information will be of help to you. Construction Question: What material is the frame made from? What are the clips made from? Reason: Quality question based on review found on your website. BEST ANSWER: The pants stretcher is made from all metal including the clips; which are used to adjust the stretcher to fit the pants. I bought mine for my jeans to make them look neater without ironing. The frame is made of metal that is very stiff. The adjuster clips appear to be made of steel. The size is a problem, for me at least. I am a big fellow and the stretchers are not large enough for 46x34 pants. I hope this helps. I wear size 40x32 my jeans have been dried in the drier many times, will this item bring the waist back to the 40? BEST ANSWER: I do not think it will bring back your waist size. I bought a streacher for waists. is this sold as 2 sets or just 2 ? BEST ANSWER: Thank you for your question. 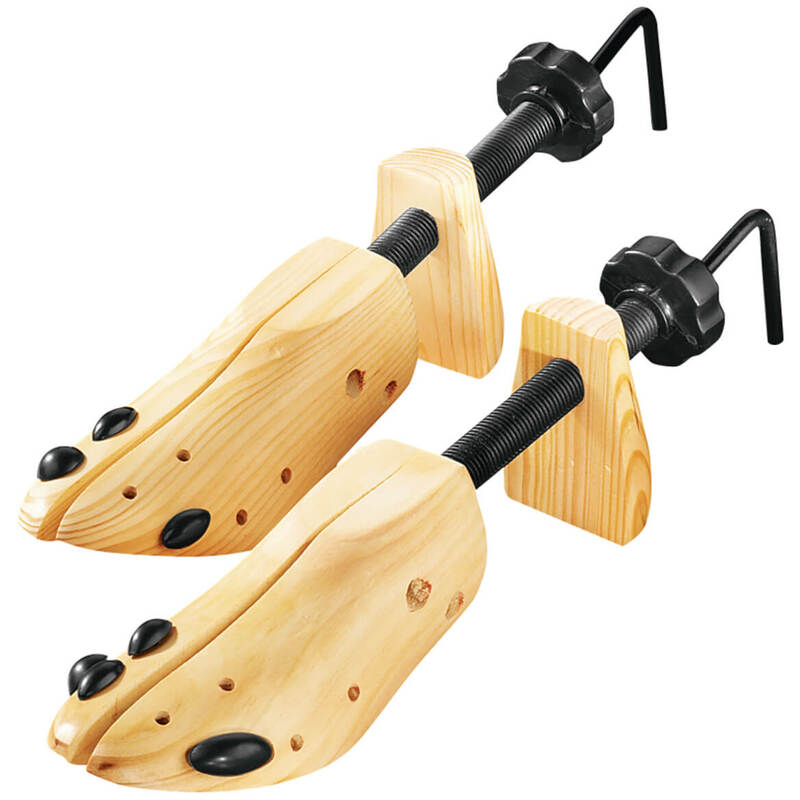 The pants stretcher comes in one pair. We hope this information will be of help to you. 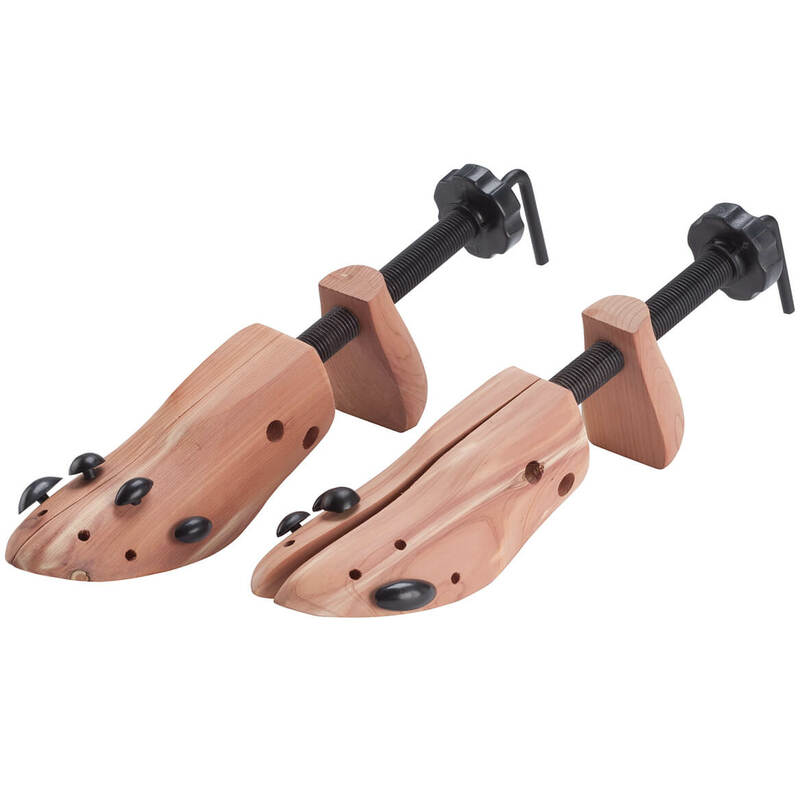 These are sold as two stretchers one for each leg, so one pair. I bought (3) pair of the pant stretchers a few years ago. The pant stretchers are still in excellent condition. I’ve misplaced two of the hangers. Is it possible to buy just the hangers? BEST ANSWER: Thank you for your question. Unfortunately no we do not carry just the hangers. We hope this information will be of help to you. do you have a larger size for 44 waist size for men's levis? BEST ANSWER: Thank you for your question. We do not have a larger pants stretcher. We hope this information will be of help to you.